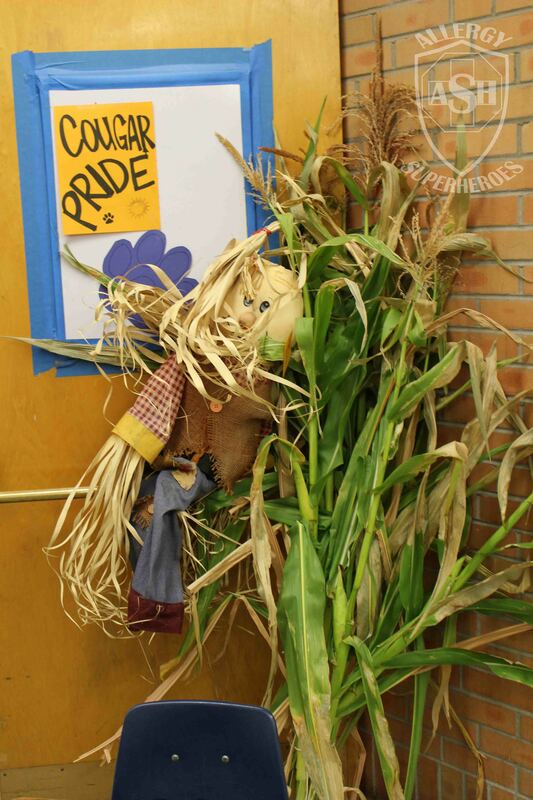 Every fall for the last two years, our elementary school has hosted a Harvest Festival. 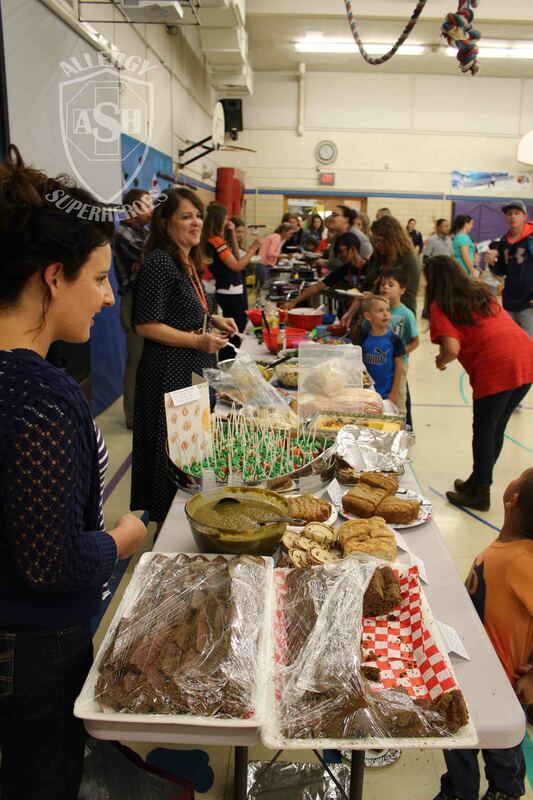 It takes place after school in the gym, and families are encouraged to bring a salad, soup, or bread to share with the community. 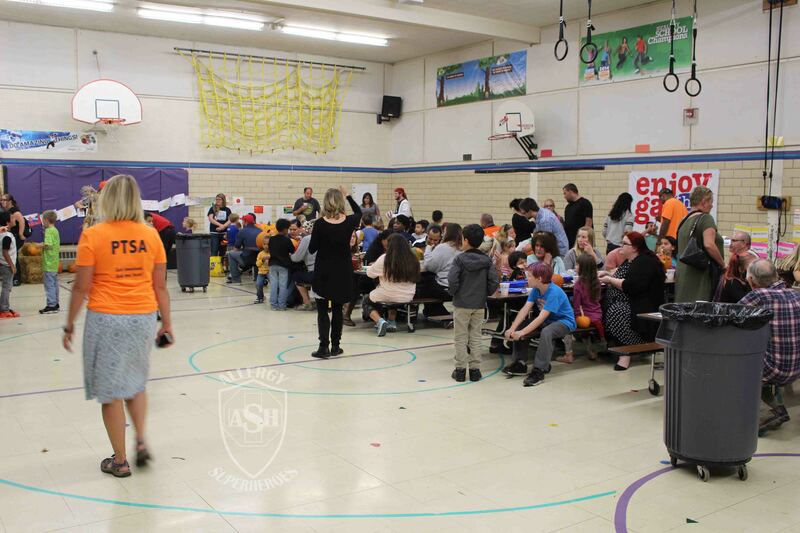 Of course, this sort of potluck event can be a food allergy family’s nightmare. We attended for the last few years, but mostly brought our own food and supplemented with applesauce and raw veggies. Mainly, we just went for the fun. This year though, the opportunity to improve the event fell into my lap. Several months ago, a mom I’ve known since our kids were toddlers together informed me that the school’s Health and Wellness Committee lacked a Food Allergy voice. I began attending meetings, but didn’t really know how I would fit things. 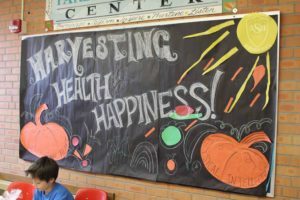 Soon though, I discovered that the Harvest Festival is run by the Health and Wellness committee. A bell went off in my head, and I realized this was my opportunity to improve things. 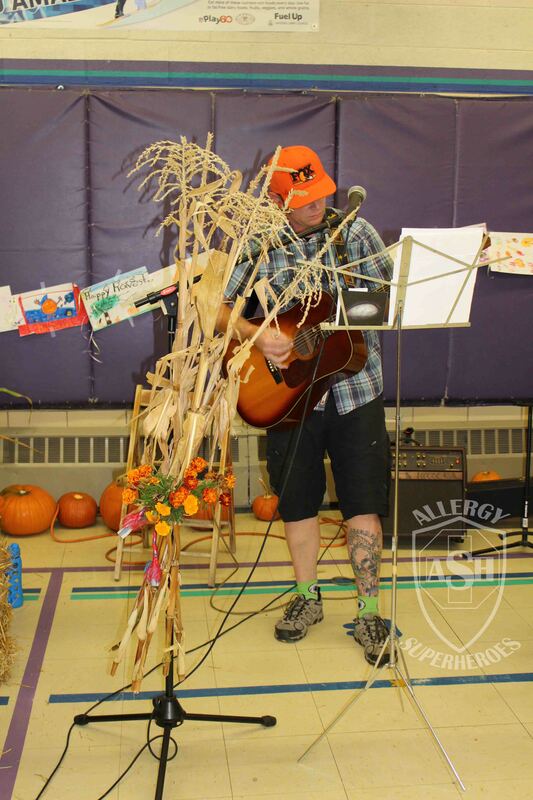 I pointed out that the Harvest Festival was the sort of potluck event that many food allergy families don’t even bother attending, because the logistics, exclusion, and even danger was too much to deal with. I declared that I would sponsor an allergy friendly table this year, and everybody was instantly on board, ready for me to guide it. 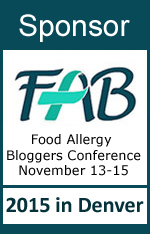 Of utmost importance to me was making sure that all fliers and marketing for the event included the information that allergy-friendly foods would be available–I wanted those same food allergy families to know that it would be worth their while to come. 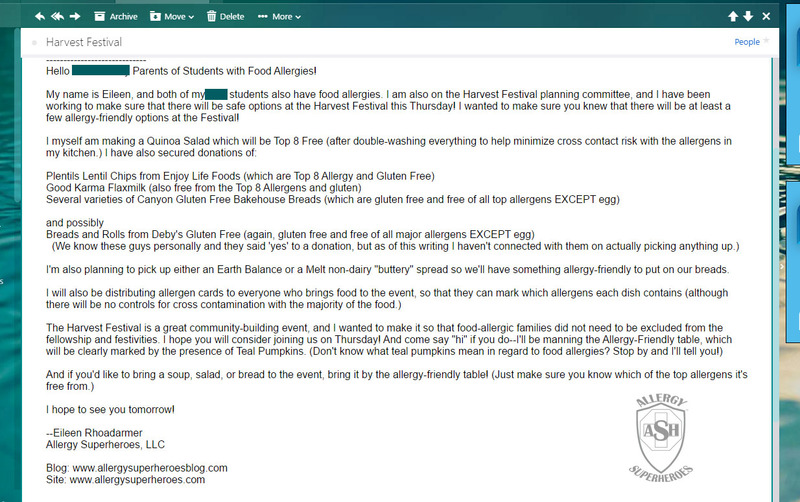 I also sent this email to our school nurse, asking her to please forward it to all known food allergy families enrolled in the school. I can’t say for sure that she did, since she seemed concerned that such an invitation would imply liability, but I sent it to her anyway. 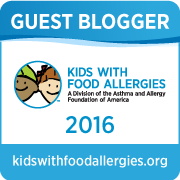 I also worked extensively on the sign-up document to give people the opportunity to bring allergy-friendly fare of their own. I also set up a list of food prep rules to help minimize the risk of cross contamination from other people’s kitchens. Sadly, I didn’t get any volunteers from parents to contribute to my allergy friendly table, although I don’t think the sign up sheet got distributed as well as it should have been. Something to improve for next year. However, Zax’s class made a top 8 free soup for my table, and one of the fifth grade teachers brought her top 8 free soup over to the table that evening once she realized it was there. 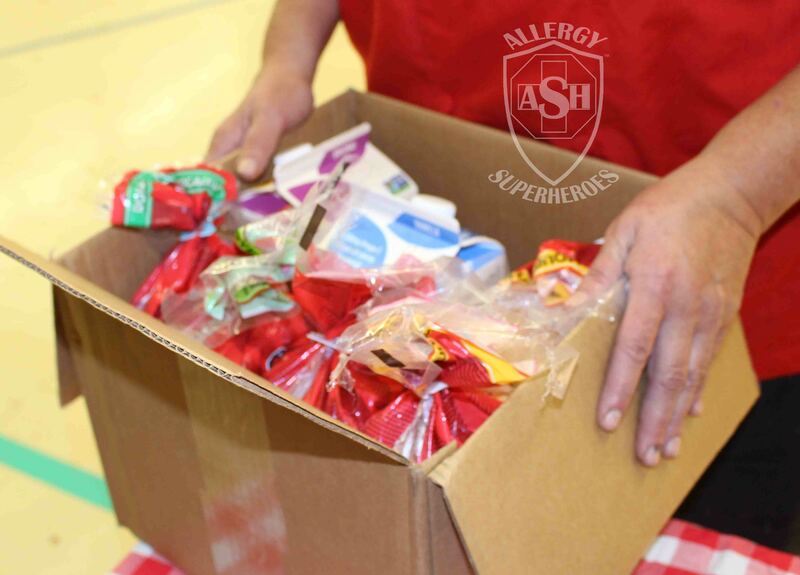 Another improvement I will make next year is to write a letter to all the teachers inviting them provide allergy safe foods, because I will probably get better engagement from them than from the community at large. Also, in order to round out the allergy-friendly offerings, I reached out to some local (and not-so-local) allergy-friendly food brands for donations, and I received several favorable replies! We had foods from Enjoy Life, Canyon Gluten-Free Bakehouse, Good Karma, and Deby’s Gluten Free! For my own contribution, I brought a Top 8 Free Quinoa Salad (a variation on this recipe, using mostly fresh veggies from my garden and eliminating the chicken) after double-washing all of my dishes to help eliminate cross contact risks. I also purchased some Earth Balance soy-free spread for the breads. One more food ended up on our table at the last minute, an apple crumble that was both nut and gluten free (but did have dairy), provided by a mom who helped her son’s kindergarten class make it. 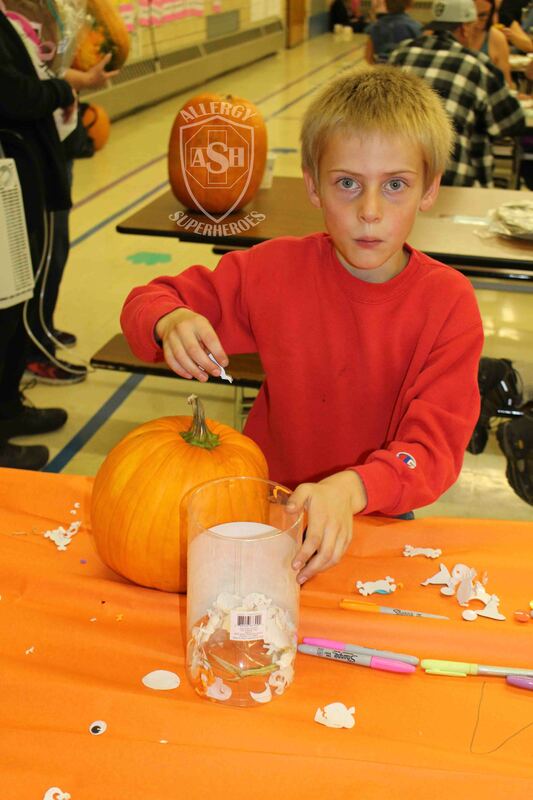 That class had both nut allergies and gluten sensitivities among its students, so making an allergy-friendly food was natural for them. I also took the opportunity to decorate the table with teal pumpkins and our Teal Pumpkin Candy Buckets, to help spread awareness for teal pumpkins and Halloween! For the rest of the food, I wanted to at least make sure allergen content was known, in case people with allergies decided to risk them. 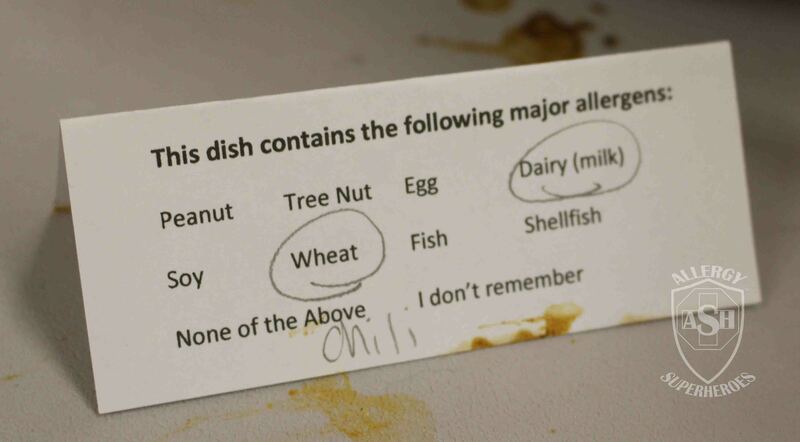 I included all major allergens on these signs, along with the option for “none of the above” so we wouldn’t be left wondering if a blank card meant “no allergens” or simply hadn’t been filled out. I also included “I don’t remember” on the signs. It’s not an ideal answer, but it is an honest one and I didn’t want anyone to leave off allergens because they weren’t paying attention. Compliance on these tags wasn’t great. Many dishes provided by the classes were already in place by the time we arrived to set up, so we were unable to track down who made most of those. 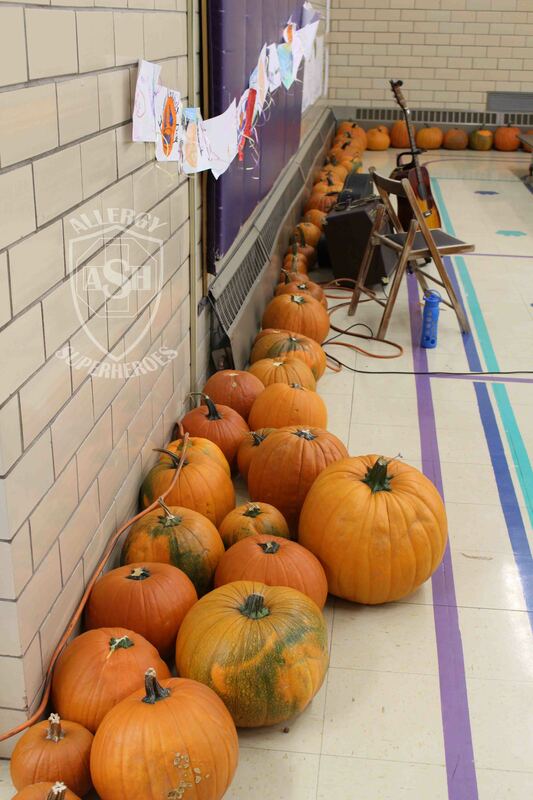 (This is another reason why I will send out letters to teachers prior to the event next year.) We tried to catch families as they arrived with food–I gave my kids the job of handing the cards out, along with pencils, because Zax loves bossing people around–but plenty still slipped past them, even with hubby as a backup. The line for the rest of the food. It was quite a feast! And then there was general ignorance of food allergies, so many dishes were probably mislabeled. I caught one woman who came in describing her soup as butternut squash made with almond milk, but when she filled out her card she put “none of the above.” I reminded her that almonds were a tree nut so she changed her card, but instead of circling “tree nuts” she just wrote “almond milk” on the side. Hubby coached another person in filling out her card–she brought chocolate-covered cake pops and needed to be informed that chocolate generally contains both milk and soy by default. Then she worked her way through and came up with the rest of the allergens on her own. These incidents could be problematic (or more specifically, the ones we weren’t able to catch) but at least the people we caught are more informed now. Also, most people with food allergies are pretty careful about what they eat–and knowing our table was there, hopefully they didn’t take chances. I put the Allergy Friendly table at the end of the food line. I didn’t want to exclude people without food allergies from enjoying our offerings, but at the same time, I didn’t want to put it at the beginning and have everybody else eat our safe foods, leaving nothing for the food-allergic folks who arrived later in the evening. By being at the end, most of the people without allergies already had full plates and bowls by the time they reached us, so it was a natural way to keep them from unnecessarily using up all of our safe foods. Packing up leftovers for the use of district food services. We did have a fair bit of food left at the end, but that just meant more leftovers! I also donated the leftover breads and unopened flax milk to the school/district Food Services department, and I know they’ll put it all to good use! 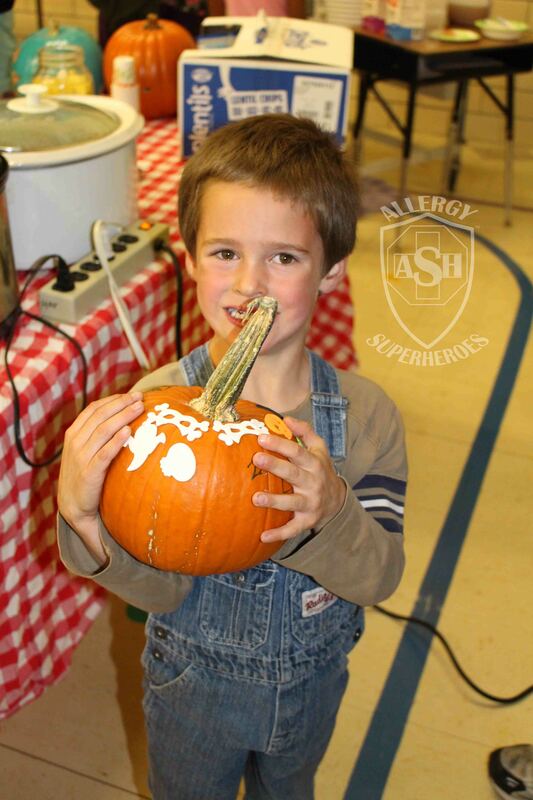 Our district’s Food Services is getting to be pretty allergy aware! 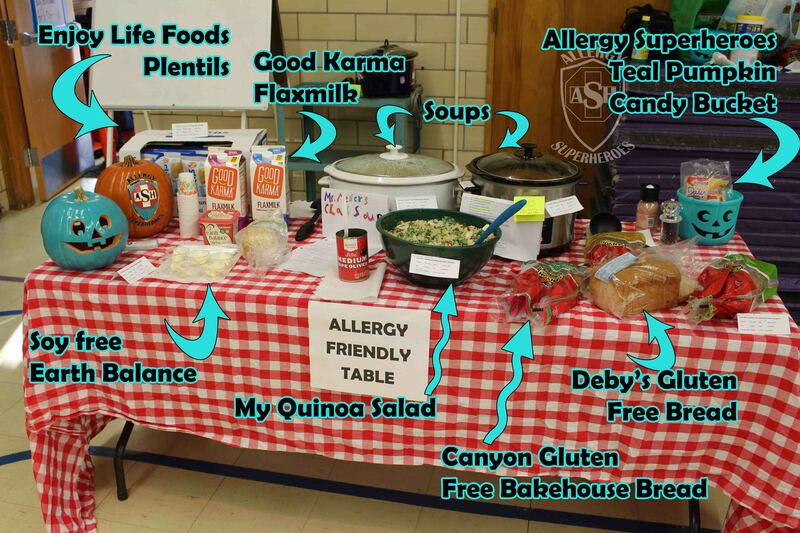 Most people passed by with little or no comment on our “Allergy Friendly” sign, but I did have a handful of people stop to talk about food allergies and thank us for having the safe foods grouped together. One girl came by with her mom–she had a tree nut allergy–and her eyes lit up when I told her that there were no nuts anywhere on the table. A boy came by, read the label on the Plentils, and walked off happy knowing that he could eat them. A man came by with a preschool-aged little girl (probably the sibling of a student) and was happy to see all the dairy-free options, since the little girl was dairy-allergic. He was thrilled to have the Good Karma Flax Milk for her to drink! Those responses made the whole thing worthwhile! And for myself and my kids, it was great knowing that we could feast freely on the foods from the table, without having to grill anyone on how they made it, read each label in excruciating detail, or worry that we were dealing with incomplete information. I stuffed myself that night! 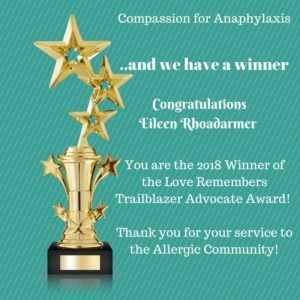 This sort of allergy awareness is seldom going to occur on its own–it takes a community driven movement, usually spearheaded by one motivated individual. If you’re wondering how you can get involved with your school, see what parent committees already exist, and where your goals may fit into them. Our Health and Wellness Committee already wanted to shift the focus away from sugar-laden birthday parties before I came around, so this was the perfect fit for me! It didn’t really take me all that long to coordinate this, and the payoff was definitely worth it. The rest of the Health and Wellness Committee thinks I should make sure that all Health and Wellness events have allergy-friendly options this year, which is an assignment that I will gladly embrace. We can change this world, one community at a time. 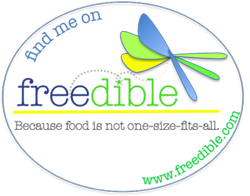 This is a fun event because kids together with their families are able to bond with the other kids and their families too. It’s part of their social training as well. But yes, it would be better to just bring your own food especially if there’s a food allergy issue in your family in order to avoid complications and allergy problems.